At this time, we do not offer any products for IR-welding. Transmittable thermoplastics can be welded to absorbent thermoplastics using infrared light. Unlike laser systems IR welding is characterised by low investment. The IR-welder is easy to use on construction sites. While designing automatic mass production processes samples and prototypes can effectively be prepared. Suitable for plastics that are transmissible for IR-radiation. Good for filigree welding structures. Particle free joints for clean room and medical applications. The method firs very well for automatisation and multi application. Glass fibres and filler should be avoided in the transparent part. 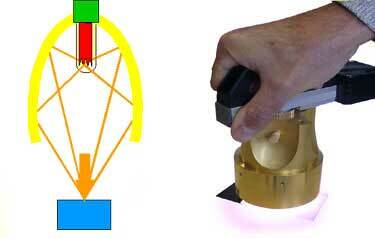 Transmittable colouring of transparent parts is possible. Our advantage: All welding systems from single source. Contact us for your welding application.